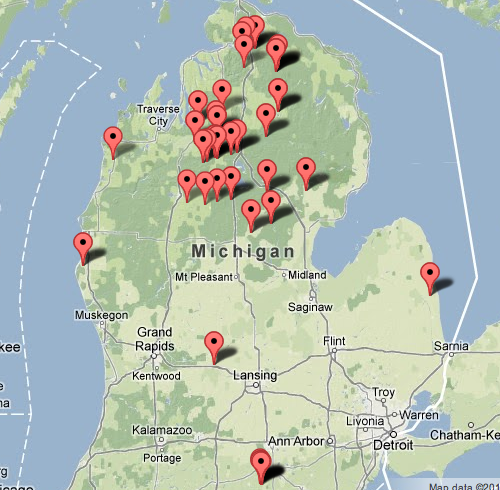 Michigan’s 21 Million Gallon Frack Job: A National Record? 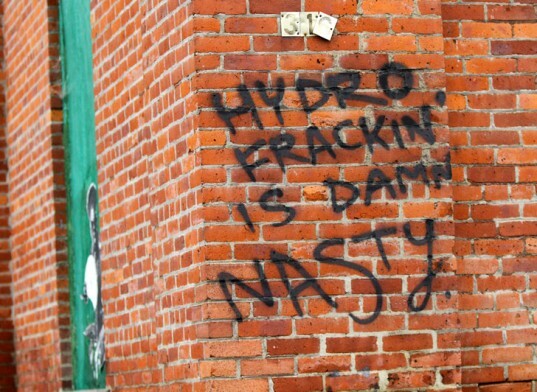 This article is re-posted from Ban Fracking Michigan. The destruction of the world’s fresh water due to fracking is at the uppermost of our minds, as we live and drink the water in the Great Lakes state. How much water is being used for Michigan’s frack industry is now proven to be obscenely underestimated. Michigan may have set a national record for allowing Encana Oil & Gas USA to frack a natural gas well with more than 21 million gallons of water. A second nearby well is set to be fracked with more than 16 million gallons, according to a permit granted Encana late last year by Michigan regulators. FracFocus says the first well, State Excelsior 3-25 HD1, was fracked on Oct. 30, and Encana used 21,112,194 gallons of water. Combined with two other horizontal wells on the same pad, FracFocus says more than 42 million gallons went permanently downhole. The Excelsior pad (named after the township) is on Sunset Trail between Kalkaska and Grayling in the Mackinaw State Forest in Kalkaska County. A permit that was issued Nov. 30, for Encana’s well State Roscommon 1-7 HD1, states the company intends to frack with 400,000 barrels. That equals 16,800,000 gallons. The company’s application adds that the wellpad is sized to accommodate “up to six or 8 HD’s” (horizontal drills). If there are eight horizontal drills on the pad, the total water usage will be more than 100 million gallons. The pad is in the Roscommon State Forest, south of Houghton Lake. The per well figures are three and four times what the industry and regulators have been saying. And it cannot be compared to the water used by farmers. Irrigation water returns to the aquifer and the hydrologic cycle. Water used for fracking is lost forever deep in the frack wells and disposal injection wells. This is a diversionary tactic to try to ignore the fact that millions of gallons of water are being destroyed forever, leaving our landscape full of frack wells and injection wells filled with toxic and carcinogenic frack wastes–water permanently diverted from the Great Lakes and now buried in the ground … in literally bottomless pits. The industry’s newest gimmick is only telling half the story about the chemistry and, there’s a catch: Little of the rain will fall in Michigan. Atmospheric winds whirl it around the world. It can fall anywhere, usually on places with wet climates or in the oceans. In addition to creating H2O, burning methane creates CO2, a greenhouse gas that accelerates climate change. Michigan is in a drought. Great Lakes levels are at near-record lows. Water is limited. Gas extracted here—or anywhere—will bring scant amounts of it to rain in our state. It’s painful to do the math on how much water this will destroy. If all 1,700 Encana well locations used 21.1 million gallons of water, 35.8 billion gallons of water would be used for Encana’s wells alone, producing even greater amounts of frack wastes, when adding in the amounts of chemicals, additives and silica sand in the injectate. And if the Roscommon and Excelsior wells are the model for the industry, it is likely there will be more than one frack well on each of the 1,700 frack well locations, more than doubling or tripling the water and wastewater estimates. Since learning of the high water use figures at the Excelsior and Roscommon wells, Ban Michigan Fracking has asked industry and environmental sources around the country to see if anyone has heard of any larger well anywhere. So far, no larger well has been identified. We will keep readers posted. The burgeoning problem resulting from all this fracking and unconventional shale gas drilling is where to put all the toxic wastes directly made by the process? Already Ohio is the recipient of the Pennsylvania frack industry’s toxic wastewater, in addition to its own, overwhelming the injection wells there. Michigan, with more than 1,000 injection wells, will quickly become a toxic wasteland, taking in frack wastes from Michigan and other locations. Its all part of the conspiracy to pollute the environment thus polluting the individual, or poisoning you, whats the point of this program? its to reduce the population and terminate peoples life span, whilst the Elite will enjoy the best food that will be uncontaminated. If the individual lives to long and is a seeker of the truth or attempting figure out whats going on, they become a nemesis to the Elite, the faster you kill people, the less wisdom gained.